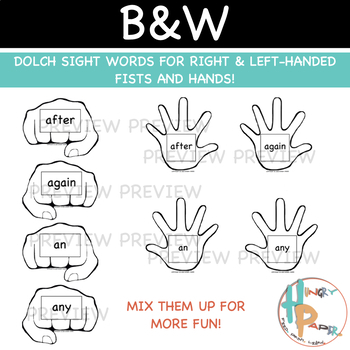 Do you need a more FUN and CREATIVE way to teach your students sight words? 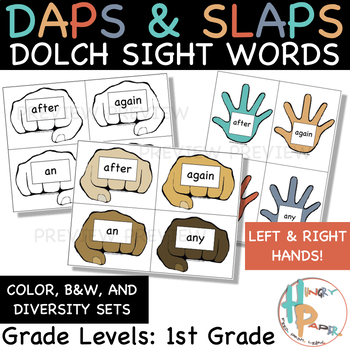 That’s where this Daps & Slaps: Dolch Sight Words resource comes into play. All you need to do is print out the set of your choice (see what’s included and colors below), cut, and laminate. Then pin a few onto your wall, door, door casing, entryway, etc. and have your students go through the Daps & Slaps motions while saying their sight words out loud. 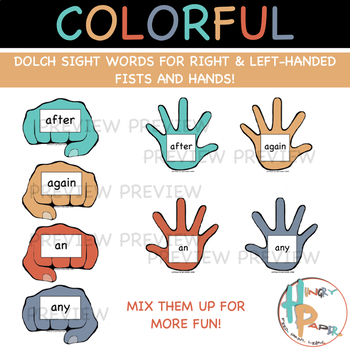 Combine the hands and fists to make it like a secret sight word handshake! 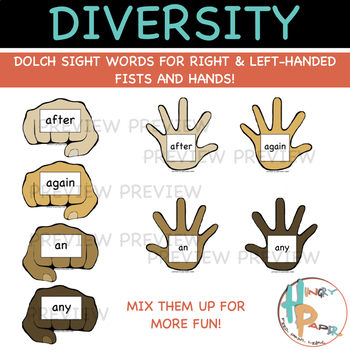 Another fun way to use these in your class is to print out multiple copies and make it a matching game, go fish game, or slapping game! Possibilities are endless! Let me know in the feedback below how you’ll be using these in your class! Confused as to what Daps & Slaps are? “Daps” is another word for fist-bump. The student will close their fist and hit it gently against the fist on the card. “Slaps” is another word for high-five. The student will open their hand wide and gently slap their hand on the card. IMPORTANT NOTE: Do not pin these cards against anything breakable! Younger kids are still learning their own strength! As students go through their daps & slaps motions, make sure they don’t hit so hard they hurt themselves! When you get a chance, feedback is appreciated! For every dollar you spend on TpT, you'll earn 1 credit—and we'll round up for you, too! If you provide fair feedback on a $4.75 item, you will earn 5 credits. Every 20 credits you earn equals $1 to apply toward future TpT purchases. Please note that TpT credits are only earned for feedback left on active, paid teacher-created resources. There isn’t an option to leave feedback when you purchase TpT gift cards so credits aren’t earned for them. Credits are not earned for feedback left on free downloads either. All content in this download has been created by Hungry Paper, including all photographs used to display resources in the preview and thumbnails. Please follow the copyright guidelines when using this or any product created by Hungry Paper. A copy of these guidelines is also included in your download. You may download and print as many copies as you like for your own personal/professional use in the classroom, etc., but please do not share with others. You MAY direct others to this link so they may purchase this product on their own, or you MAY direct them to my TpT store. Thank you very much! LOOKING for MORE great RESOURCES??? Be sure to follow my TpT store by clicking on the ‘Follow Me’ next to my Seller picture to receive notifications of new products and upcoming sales.